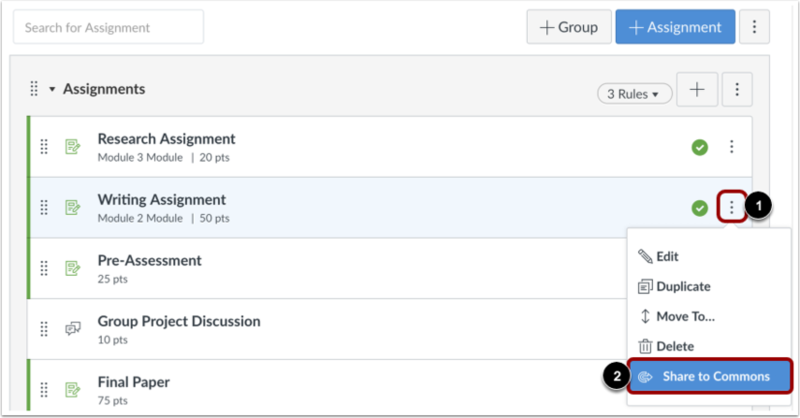 You can share assignments, modules, quizzes, pages, and discussions in Canvas to Commons. 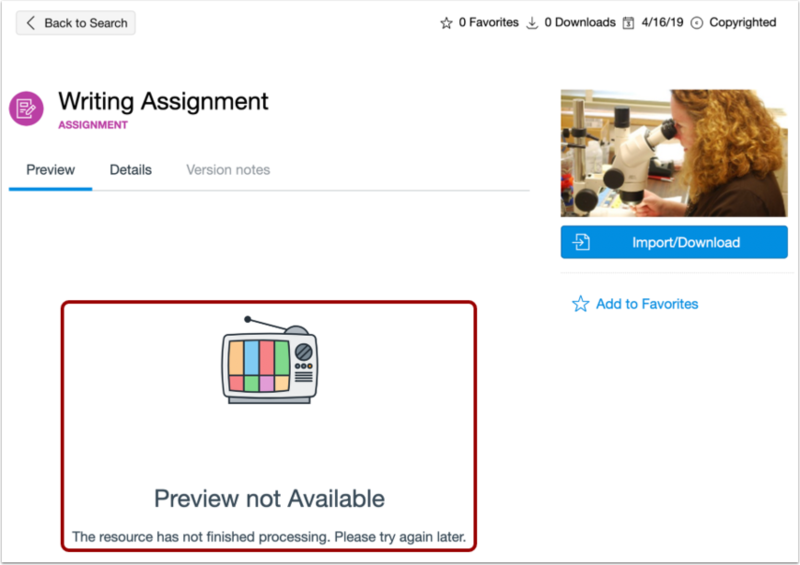 To modify an existing shared resource, learn how to update a resource previously shared to Commons. The steps in this lesson are similar for sharing assignments, modules, quizzes, pages, or discussions. 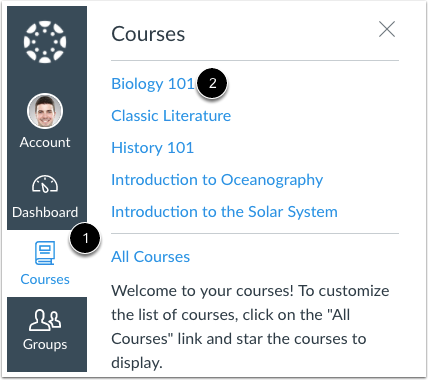 The differences include opening the feature from Course Navigation and using the Settings icon on Index and Details pages. The images in this lesson illustrate how to share an assignment to Commons. The file size limit for uploaded content is 500mb. 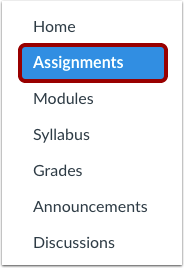 In Global Navigation, click the Courses link , then click the name of the course you want to share the resource from . In Course Navigation, click the feature area link where your resource is located. Locate the resource you'd like to share within the feature area page, click the Options icon , then click the Share to Commons link . Note: If there is a rubric attached to a resource, it will be shared to Commons as part of the resource. The attached rubric will also be imported as part of the resource. You can also open the individual resource to share to Commons. Click the Options icon  then click the Share to Commons link . Note: Depending on the account settings set by your Canvas admin, you may be unable to view and/or share public content. Authors of publicly shared resources will always be able to view their resource. Select your content license from the Copyright and Licenses drop-down menu . To add any additional licensing, copyright, or usage information, click the Add Additional Information link . 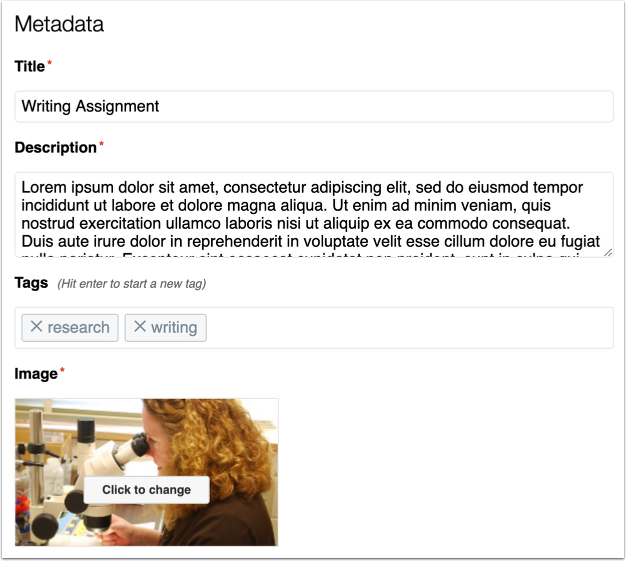 Enter resource metadata and add a thumbnail image. View your shared resource. It may take up to 30 minutes to process a resource. Resource previews are not available while the resource is processing. 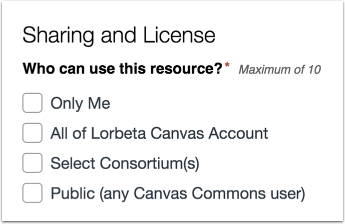 Previous Topic:How do I share a course to Commons? Next Topic:How do I share a document, image, video, or audio file to Commons? Table of Contents > All Users > How do I share a resource to Commons?